Play Cribbage -- Board and Card Games Online. Play cribbage for FREE or Win CASH! Six Card Cribbage is a two-player game of skill that uses a standard 52 card pack. The goal is to be the first to score 121 points over several deals. Points are scored for card combinations that occur during the play or in a player's hand or in the crib -- the cards discarded before the play. Five Card Cribbage variation is an older traditional version that is still popular in England. 5 card Cribbage differs from the more modern 6 card cribbage by the number of cards in hand (initially 5) and by the score to play - usually it is played to 61 points. Paul Rice of Wells, ME who plays in US national cribbage tournaments says that in cribbage "75 percent or more" depends on the skill of the player. Per Paul Rice: "in cribbage, every card you play and every card your opponent plays, you're trying to throw a curve ball in there"... "you can be dealt a gosh-awful hand and if you play it right, you can advance up the board." See Cribbage Hands. Cribbage Live is a must-have app for your phone or tablet. Works great on iPhone, iPad and all Android phones and tablets. This card game book is focuses on the 121-point Cribbage. 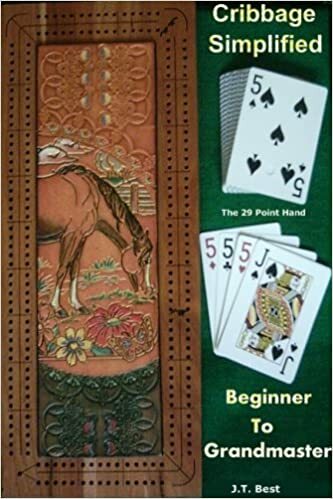 This book is helpful to both cribbage beginners looking to learn the card game and advanced players who wish to build on their existing skills. The book offers checklists, illustrations, charts, diagrams and exercises in cribbage. The author makes the game of cribbage easily understood by giving hands-on material and newly invented playing techniques. This 158 page book will take your cribbage game to a whole new level.